Daisy wedding bouquets have lovely long stems, so long I can use them to conceal the bouquet handle. 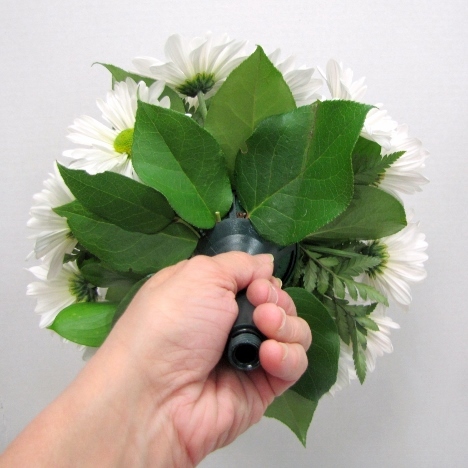 The goal is to completely cover the mechanics of the bouquet, so the wedding guests will never suspect that this isn't a true hand tied design. I'm going to continue by using a few more salal leaves for the underside of the bouquet. 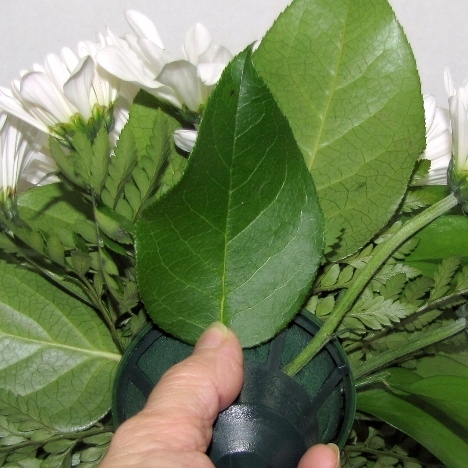 Insert the leaves into the foam slots under the bouquet facing right side downward. 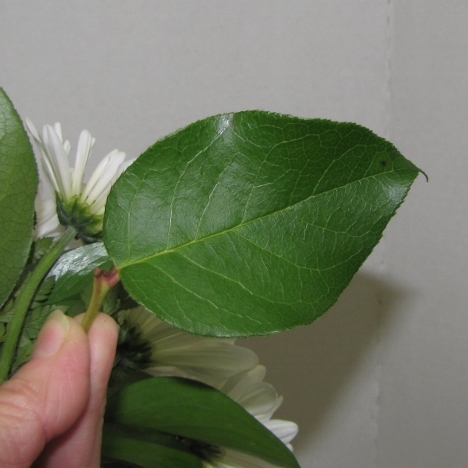 You don't want to see the "wrong" side of the leaves if you look under the bouquet head. 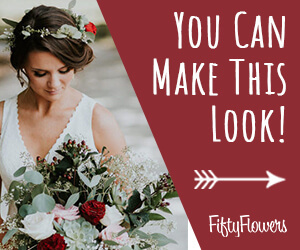 Work your way around the entire bottom the the bouquet. Cover with the salal leaves until you don't see any bouquet holder grid or foam. 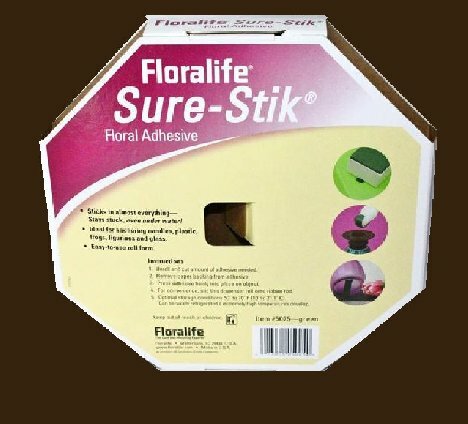 Floralock adhesive is what professional florists use to keep bouquet stems secure in wet floral foam. Shake can thoroughly before using. Insert the attached straw securely into the nozzle head. Insert the red straw deep into the bouquet and give quick, short bursts. 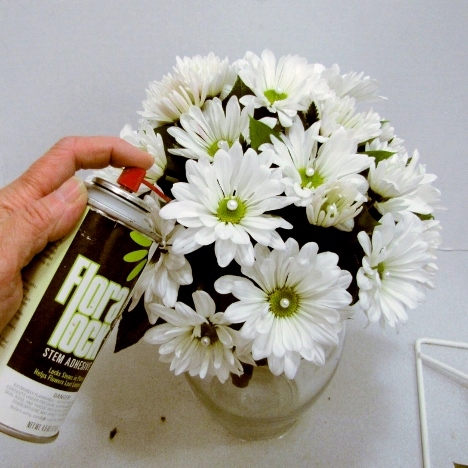 Do not overspray, or you could have glue adhesive dripping down the sides of your bouquet and making your handle sticky. Don't miss the underside where the leaves are inserted. 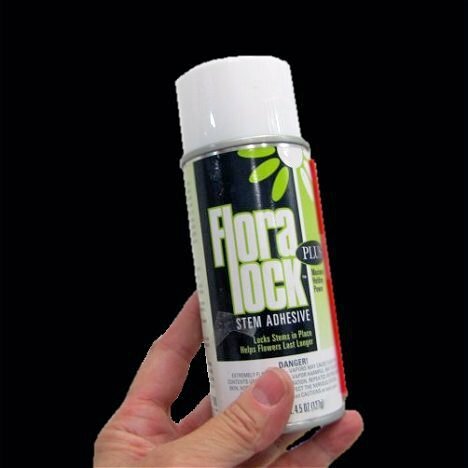 Give a few quick sprays to be sure leaves are securely attached to the foam. 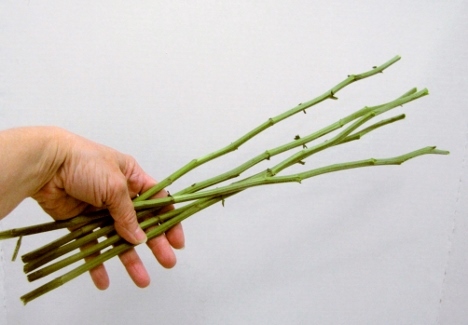 Clean the discarded stems that were left over from when you cut off the flower heads. 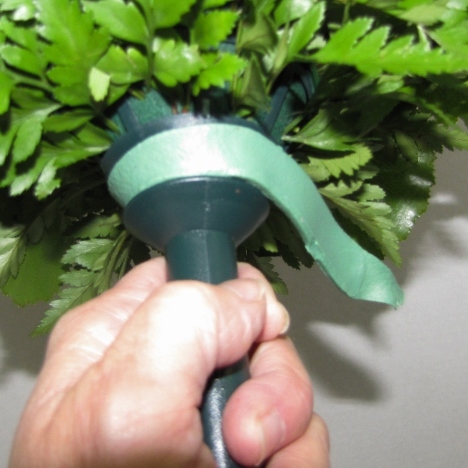 Remove any leaves and make sure the stems are smooth and clean. 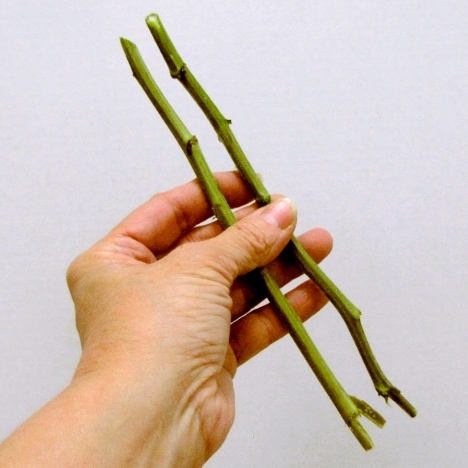 You'll need enough stems to cover the handle mechanics. 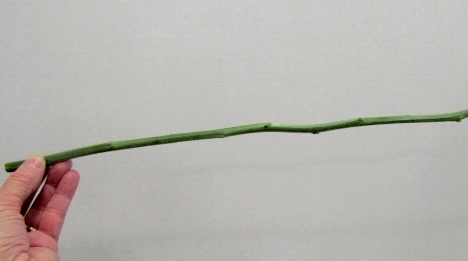 Typical daisy stems will be long enough to cut in half to double the amount of stems you have to work with. 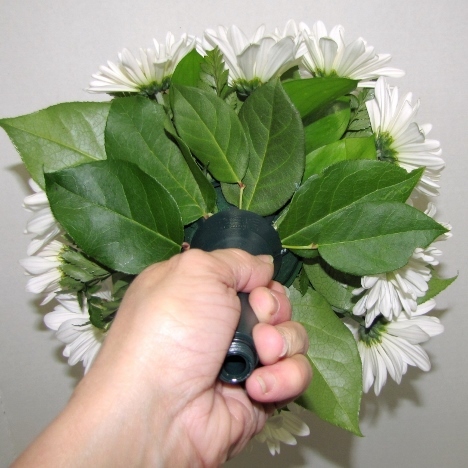 Cut the top of the stems at a sharp, diagonal angle that will insert upwards into the leaves in the underside of the bouquet design. 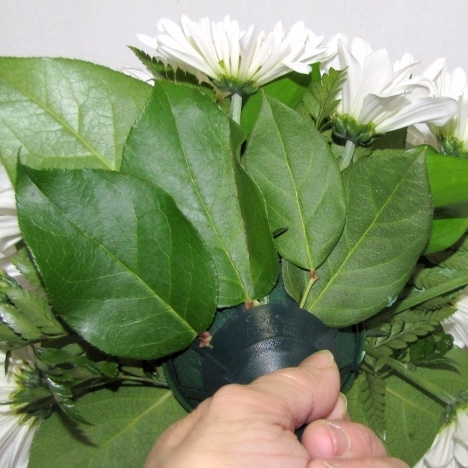 Cut the top of the stems at a sharp, diagonal angle that will insert upwards into the leaves in the underside of the bouquet design. You can see how I lay a stem tightly against the bouquet handle, allowing the top to bend and "disappear" in among the leaves. 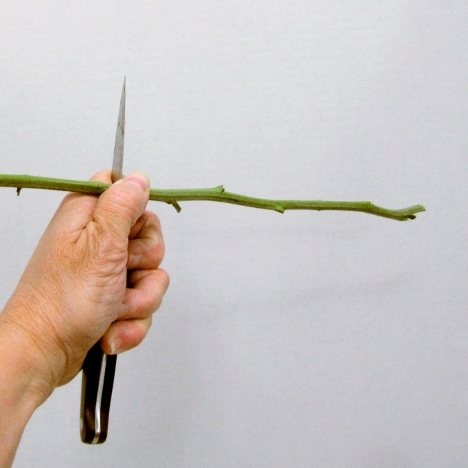 I could just bunch the stems around the handle and tape. But I like to make sure my stems lay properly and conceal all my mechanics. 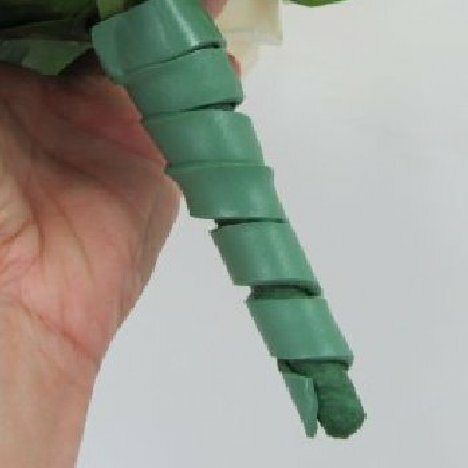 It's easier if you use floral clay wrapped around the handle to press the stems into and hold them in place before wrapping with florist tape. Just peal off the outer tape wrapping and stretch the clay around the stem of the holder, starting high at the top. 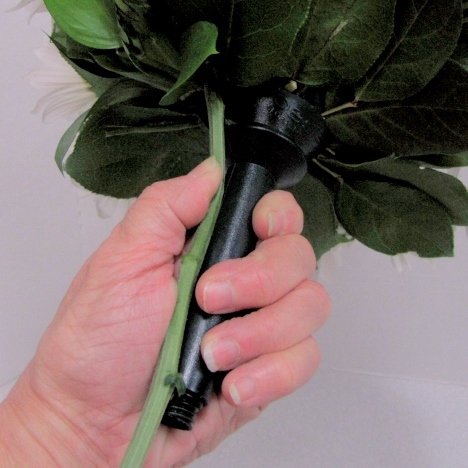 Wind the sticky clay down the bouquet handle.